Erie Limited wrote: A quick report on today's ME-2. 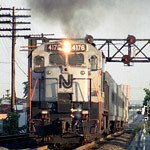 Missed the head end, but caught the tail end of todays train returning to Metuchen. Was told 20 cars, saw myself that at least half were covered hoppers. ccutler wrote: Its encouraging to see so much business there again. Do you know what types of loads are going up the Millstone branch? There is the one plastics customer on the Delco Lead. Then there are at least three to four active customers on the Millstone. I think there are two other plastics customers (one is visible just west of Jersey Ave, I think they make plastic shopping bags), a recycling company that gets crushed glass and/or plastic in three-compartment covered hoppers and, I think, a customer that still occasionally receives box cars. In addition, does the Wenner Bakery that is now open on Jersey Ave just North of the Millstone IT, receive cars? It was said in a news article when it was being built that they would make use of a rail spur. Looks like there were at least 6 covered hoppers for the Delco Lead today, and that is where the crew was headed per their discussion with the dispatcher. While waiting for Amtrak's train 90 (Palmetto) at Metropark station, I caught the Metuchen to Oak Island freight transfer. The train had a pair of NS six axle engines and a CSX GP40-2. The video was taken with my cell phone, so it's not the best, but still neat catching this move. Not sure what the current symbol is for this train. OCtrainguy wrote: ...Not sure what the current symbol is for this train. Thank you. I remember when it used to have an "OI" designation. CR-ME84 Headed west on 2 off the Lane Runner all the way to Lincoln. Any word on whether or not the wye track off the corridor in Metuchen that crosses Vineyard road will be used to run trains into that huge warehouse they are building where the emerson plant used to be? I highly doubt they will get rail service. Right now the track ends at Vinyard Rd. The crossing and track to the old building are gone. Conrail would charge an exorbitant amount of money to replace it, ending and incentive to get rail service. From the looks of it Conrail is not interested in getting new customers. Take a look at the old GM site in Linden. Three new warehouses were built right across from the NEC and the old Linden yard. But no rail connection was put in. While we're on the subject, does anyone know when the last time this line was used and what it was called? And if there's any chance it'll be used again? Driving on 287 you can tell the line is all overgrown. I would like to know what happened with those warehouses in Linden though, it seemed perfect for rail. Nice to be making so much cashola you don't want any new customers!! The former Westinghouse facility had a siding that crossed Vineyard Road and then continued past Westinghouse and turned towards Route 27 to service the old W. T. Grant stores warehouse. Before crossing Vineyard, there were two warehouses. A siding was there and maybe still is. One of the Warehouses was Don's Speed Shop. Not sure if one or both received cars. Further down on Route 27 on Talmadge Road, was an envelope company that had a siding that came off the PRR's "0", or "ought" track. This was right by the return loop track for Camp Kilmer. Also in the area was Lorraine Oil. They had a siding just before the entrance for Metuchen Yard. I think it's now a church. Metuchen Yard had two industries, Mueller Mix, a cement mixer manufacturer right across from the yard office and a plastics company in back of the cement mixer company. The plastics company always had fires there during the 1960's. There was also a team track right across from Lincoln Tower. Remember box cars being unloaded there in the 1960's. Speaking of Lincoln Tower, during the winter of 1964, a snow storm sidelined the GG-1's and a lot of passenger trains came up with Southern and RF&P e-units. Passed through Edison at about 5:25pm.